With last week's reveal of the production version of the Chevy Volt comes a rumor GM will sell the Volt across the pond as an Opel. No, we're not talking about a Segway-pooping Opel Flextreme, we're actually talking about an Opel Volt. Our sources tell us to expect the 2011 Opel Volt to be mechanically identical to its Chevy sibling and share much of the overall exterior and interior styling. The most noticeable change to the Opel Volt will be a unique front fascia and headlamps. That’s right folks – platform prostitution is rocking down electric avenue and coming to the Volt — and we've asked our friends at KORS Design to render something up for us based on the details we provide below the jump. The upper grille will carry a design similar to the Opel Flextreme Concept in that it will feature a clear cover over the Opel wing and badge. The headlamps will also share a design from the Flextreme in that they’ll dive from the upper fender towards the grille and then wrap downward to an LED fog lamp. Expect this design to be flush mount to the fascia surface. The Opel Volt’s bodyside will carry-on virtually unchanged except for a slight adjustment to the lower rear door surface and the shoulder will now rise quickly into the C-pillar giving the DLO a more refined appearance. Changes to the rear will be minimal, but look for a revised design to the details within the LED taillamps and of course an Opel badge replacing the Chevy bowtie. Doesn't this sound fun? What's even more fun is the interior. Fans of the black iPod will be happy to know the Opel Volt’s interior will replace the gloss white look of the Chevy with a gloss black finish on the center stack and door pulls. The interior lighting will also be replaced with Opel’s signature red and it’s likely that the dual 7” screens will reflect these changes as well. A sportier Opel badged steering wheel will replace the Chevy unit but will continue to offer the same functions. 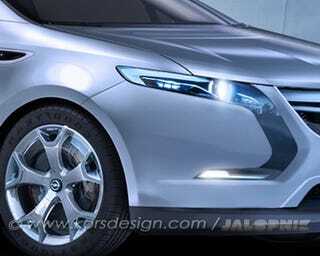 GM will likely debut the 2011 Opel Volt at one of the European motor shows in the near future. Remember, you heard it here first.